WordPress versions 4.6 and earlier are affected by two security issues: a cross-site scripting vulnerability via image filename, reported by SumOfPwn researcher Cengiz Han Sahin; and a path traversal vulnerability in the upgrade package uploader, reported by Dominik Schilling from the WordPress security team. 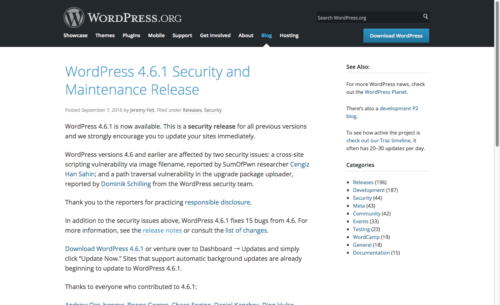 In addition to the security issues above, WordPress 4.6.1 fixes 15 bugs from 4.6. For more information, see the release notes or consult the list of changes.